Khamenei often lashes out at Israel and the US and has positioned Iran as a key supporter and funder of Palestinian terror groups. Everyone should know that the satanic and vicious plot that the U.S. has for #Palestine— calling it the Deal of Century— will never happen. The turbulent dream that Al-Quds would be given to the Zionists will never come true. The Palestinian nation will stand against it and Muslim nations will back the Palestinian nation, never letting that happen. The comments come a day after Khamenei called for better ties with the world — though not with the United States, his official website said on Sunday. “Except for a few cases — such as the United States — Iran’s relations with other countries, including with the West and the East, must expand and further develop,” he said. 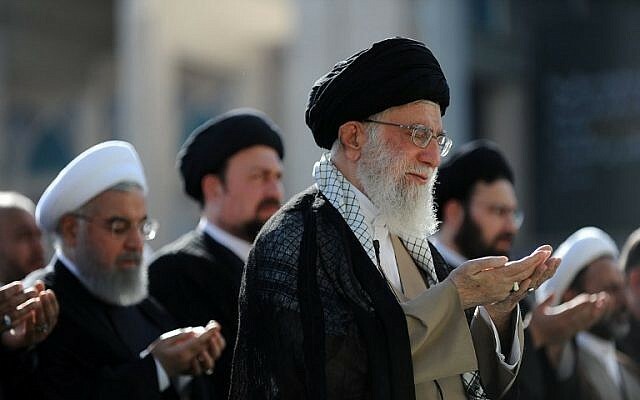 Khamenei’s statement recalls a famous slogan from the early days of the 1979 revolution: “Neither East nor West, Islamic Republic,” echoing a desire to strike a path independently from the major Cold War powers. In February, Khamenei surprised observers by saying that Iran now prioritized ties with the East over the West — reflecting the much stronger ties it has developed with Russia and China in recent years. The Trump administration has been working on a peace plan it says it hopes to present to the sides at a future date. The Palestinians have rejected the plan, and ceased cooperating with the US administration after US President Donald Trump recognized Jerusalem as Israel’s capital last December and moved the American embassy there in May.